On the occasion of the Heartbleed security vulnerability that is currently making headlines, our Cartoonist reminds you of how it all really began. A gasoline pump has the word "GAS" imprinted on it. An automobile is being refueled. Gasoline is seen overflowing and forming a large puddle on the ground. Off-panel voice: Watch out! It’s overflowing! The next panel shows a first man with a beard and a second man. Bearded man: Next time I’ll go to a gas station that has auto shutoff. 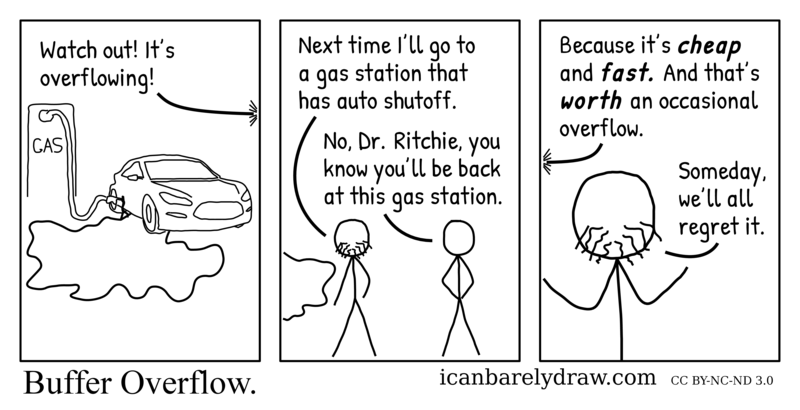 Second man: No, Dr. Ritchie, you know you’ll be back at this gas station. The third and final panel shows only the bearded man, in a closer view. Off-panel voice: Because it’s cheap and fast. And that’s worth an occasional overflow. The bearded man is seen holding his arms, elbows down, hands up, in a gesture of resignation. Bearded man: Someday, we’ll all regret it.